We depend on volunteers who share their talents and time to help with projects such as fundraisers, student workshops, the Youth in Arts Festival, and the Homecoming Festival. A treasured annual tradition featuring outstanding entertainment, family friendly activities, food for every taste, a carnival, and two nights of fireworks. 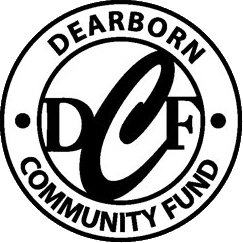 Every year, the Dearborn Community Fund selects 12 sculptures which are placed around east and west Dearborn and at the Ford Community & Performing Arts Center. The DCF puts on this annual festival at the Ford Community & Performing Arts Center, featuring student art exhibits, instrumental and vocal music, and dance performances. Local high school students are in the process of designing a mosaic to be installed in Dearborn’s new Intermodal Passenger Rail Station, scheduled to open in 2014. You can help the Community Fund by making a donation. The DCF is a 501(c)3 nonprofit organization. Donations are tax deductible to the full extent permissible by law.